Taking a clue from that, London Sinfonietta presented two performances of Mixtur in complete darkness, "to preserve the mood". Gillian Moore, in a brief introduction, set the piece in chronological context; this chamber orchestra version (1967) came into being just before the Queen Elizabeth Hall opened and London Sinfonietta was launched. Since the concert was to be 2 X approx 20 mins total (Stockhausen forbade the inclusion of any other music at its performances; he would not have had London's transport in mind!) it might have been have been more helpful to have begun with an illustrated introduction by the conductor, orchestra and engineers (who had updated the original electronics with computers). 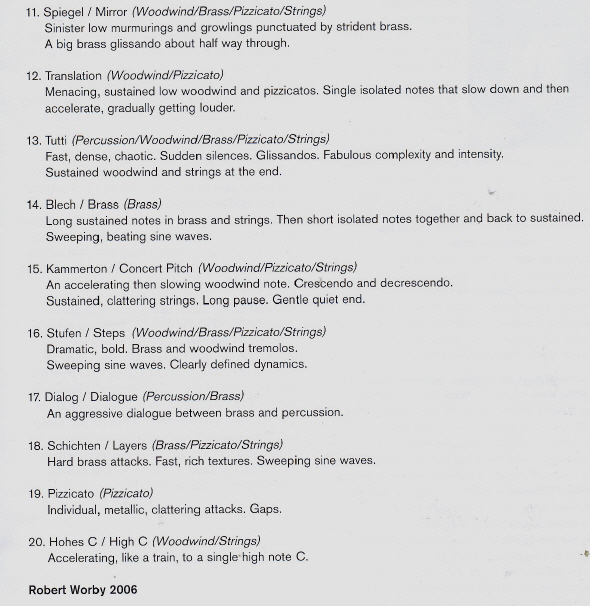 Failing that, they should have made it possible for those interested to be able to follow the structure in the intended-to-be-helpful Table of Moments in the programme book by Robert Worby, who writes that "even today it sounds like music from the stars" and contributes an essay on Listening to Stockhausen to the composer's website. 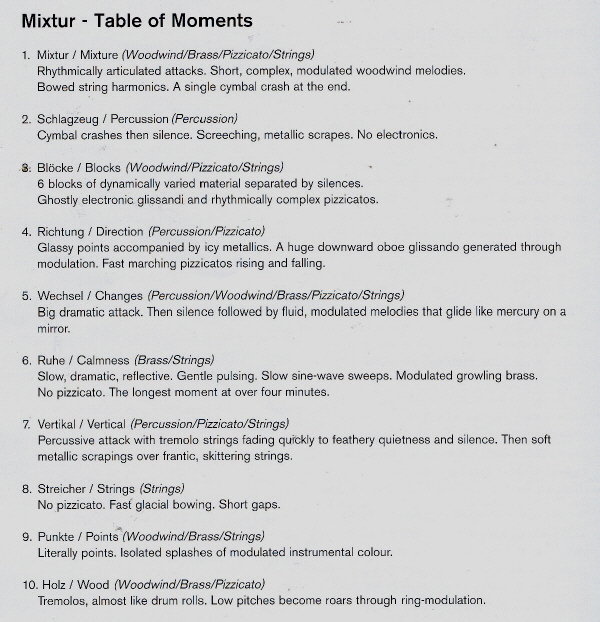 Also from the same website you can get a fair idea of this intriguing music by listening on line to Moment 19 pizzicato, which - as Worby describes - comprises music and "gaps"; those - throughout the work - make it hard in the dark to tell when one Moment gives way to the next. The sound was clearer than I recall from those early days; ring modulators used to produce interesting but edgy and sometimes frankly unpleasant effects. Separating the groups of players behind perspex screens prevented any unwanted 'bleeding' of instrumental sounds, so that Mixtur reached us, mainly from loud speakers, with admirable focus and clarity, and maintained interest through timbre alone, no other structural elements being intelligible. The score allows for some choices of ordering. The first performance last night was given in retrograde order, so that to give the Moments from 1 to 20, the players merely had to start again with their piles of paper as they had left them at the interval. Hearing it thus made little difference, apart from the volume having been set louder for the repeat*, that to the good (an unusual comment from Musical Pointers, which more often has to run from distortion and over-amplification!). 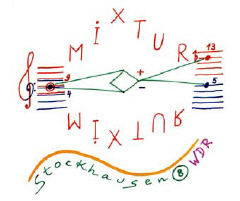 The large, enthusiastic audience included some 150 schoolchildren, who had participated in associated interactive workshops on Mixtur & Stimmung, and heard pieces of their own played back through a ring modulator; perhaps the LS Education Department did better by them than did London Sinfonietta for its evening audience? * Reviewers in the "Nationals" didn't seem to notice that! q.v. Andrew Clements ' - - The second version seemed far more vivid and energised than the first - - ', but Classical Source astutely noted that the forward version was delivered more quickly – just over 23 minutes – and that the electronic effects sounded more prominent. The illustration above comes from an article which I commend to interested readers, about making the CD of Mixtur.